Google News doesn't mark articles as satire in Web results. Hillary Quits Race! The Problem With Google News and Labeling Satire. Web results offer a Google News preview that doesn’t show satire tags. For Google and Google News, search ranking and demarcation are everything. It’s complicated to figure out which information users want to see and how to balance that with which information they should see. Google does research about how to deliver better results and sometimes bumps up against the ethical implications of the power it and other search engine developers hold. And when it comes to labeling satire in Google News, the company seems to have some more work to do. 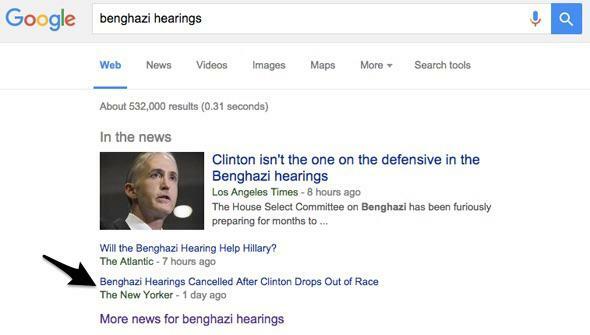 A Slate staffer noticed on Wednesday that when he searched for “benghazi hearings” on Google, a Google News preview called “In the news” came up before the search results, listing three news articles. The problem is that one of the articles, “Benghazi Hearings Cancelled After Clinton Drops Out of Race,” is from the New Yorker’s humor blogger Andy Borowitz. 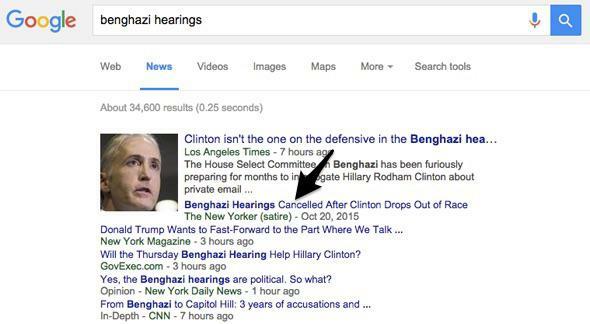 His Borowitz Report is known for a particular brand of news satire, and Google is in on the joke. On full Google News results pages, the company adds the tag “(satire)” under Borowitz Report headlines. But on the main Web result page, the News preview doesn’t show that tag. The full news results have the tags. At least when it comes to the Borowitz Report, Google News is able to accurately identify satire. But since the service isn’t consistently labeling results as such, it is in danger of perpetuating the Borowitz Problem. It seems like maybe the situation stems from an aesthetic decision or is even just an oversight, but if Google wants to include satire in its news results, the company needs to be careful to attach the label every time. I reached out for comment and will update if I get a response.